Start of a US-Sri Lanka 'Reset'? U.S. Secretary of State John Kerry visits Sri Lanka, bringing reassurances. 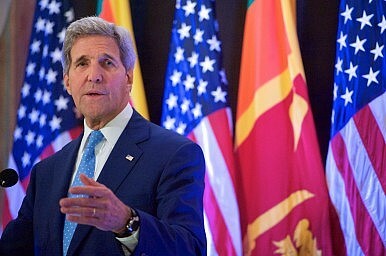 U.S. Secretary of State John Kerry recently visited Sri Lanka. He was accompanied by Nisha Biswal, Assistant Secretary of State for South and Central Asian Affairs. Kerry and company were welcomed with open arms by the Sirisena administration and this high-level visit is the latest (and most prominent) reminder that Sri Lanka’s recent political shakeup is a genuine game changer for the Obama administration. Among other matters, many may be left wondering about the Obama administration’s past proclamations regarding justice and ‘accountability’ for alleged wartime abuses during the end of the country’s civil war. Kerry expressed hope that Sri Lanka’s domestic accountability mechanism would adhere to international standards. In an optimistic speech at the Taj Samudra Hotel Kerry gave a wide-ranging talk that covered everything from devolution to regional economic integration to climate change to a brief reference to democratic backsliding in the Maldives. Kerry also noted the commencement of an annual “partnership dialogue” between Washington and Colombo. He outlined the possibility of U.S.-Sri Lanka cooperation in four areas: reconciliation; justice and accountability; human rights; and the strengthening of democratic institutions. Throughout the speech Kerry consistently struck notes of hopefulness and a desire for collaboration. Washington is more than willing to offer assistance, but that’s a decision for Colombo to make. Clearly, Kerry came to the island nation bearing reassurance that the acrimony that had plagued U.S. – Sri Lanka ties in recent years was a thing of the past. The Sirisena administration has given assurances that the creation of a domestic accountability mechanism is ongoing and has indicated that they would be willing to receive technical assistance from the United States. Let’s wait and see how quickly any of that happens. Parliament’s recent passage of the 19th amendment to the constitution (which trims presidential powers) has been meet with high praise in Washington and, with a Rajapaksa comeback looking increasingly unlikely, the U.S.-Sri Lanka “reset” is obviously moving quickly. Sri Lanka’s political situation is still fragile and the lasting effects of Maithripala Sirisena’s rise to the presidency remain unknown, although, for now, one thing looks clear: he has many new friends in Washington. Taylor Dibbert is a freelance writer based in Washington, D.C. and the author of Fiesta of Sunset: The Peace Corps, Guatemala and a Search for Truth. Follow him on Twitter @taylordibbert. During the U.S.-Sri Lanka Partnership Dialogue, Washington should elevate Sri Lanka’s transitional justice debate.